The Sarawak Cultural Village is a village that houses the homes of various indigenous people of Sarawak and displays the culture of these people to visitors. The main attractions of Sarawak Cultural Village are the live houses of the different indigenous tribe, each built along a trek that surrounds a man-made lake and sprawled on 17 acres of land. There are altogether displays of houses from 7 different peoples of Sarawak, namely the Iban, Bidayuh, Penan, Ulu, Melanau, Malay and Chinese. Visitors will be surprised to learn that there are as much as 150 people staying within this tourist attraction, and this place is actually a living exhibit. Display of houses start with the Chinese farm to see how birds’ nest are prepared, followed by the Malay town house, where displays of traditional medicine preparations will be showcased. Next is the Melanau tall house, built on stilts above ground to avoid the dangers of the animals from the forest. After that, the Orang Ulu longhouse, the mainstay of many tribes in Sarawak. Then, visit the Penan Hut, followed by the Iban and Bidayuh longhouses. As visitors walk from house to house, stopping by to view the structure and design of each one, they will get insightful glimpse into the essence of the daily lives of each tribe, from games to handicrafts, rituals to dances. The lake that is central to the village never leaves visitors’ eyes in between stops at houses. There is no other place in Sarawak where visitors can get an all-in-one visit of experience that comes infused with the culture of 7 different types of cultures and peoples. 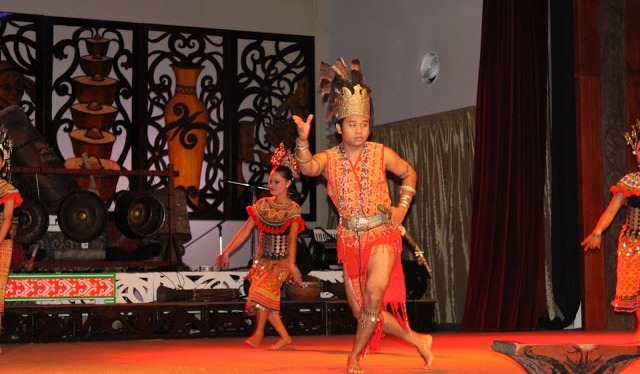 Sarawak Cultural Village is located at about 40 kilometers away from Kuching, approximately 45 minutes drive. The best way to reach the village is by taxi or by joining a local day tour. Entrance fee to Sarawak Cultural Village is RM 60 for adult and RM 30 for children between 6 and 12 years of age. The village opens daily from 9am to 5.15pm. Live cultural shows are staged twice daily, from 11.30am to 12.15pm, and 4.30pm to 5.15pm.